James Keogh, the Aussie singer-songwriter behind Vance Joy, brought his sunny disposition and backing band to balmy L.A. on Thursday night to perform “Saturday Sun,” off his latest record Nation of Two, on Jimmy Kimmel. For those who gathered to watch his performance in person, he played an additional four songs off-air which were live-streamed online and are still available. Nation of Two is Vance Joy’s sophomore album, which came out in February of this year. Keogh’s love and bright spirit can be felt coursing through his records, but Vance Joy shine live. The intimate lyrics expand to create a community in the crowd, knitting them together and keeping the original closeness alive. Performing “Saturday Sun,” Keogh is, for a moment, the sun, his smile radiating pure joy into the audience as he bounces along. The band also performed “We’re Going Home” and “Lay It On Me” last night, both off Nation of Two. “Lay It On Me,” incidentally, came out exactly a year before this Kimmel performance on July 12, 2017; Keogh mentioned that the first time he played it live was previously on Jimmy Kimmel. He also played two songs from his debut album, Dream Your Life Away. Throughout the performance, and particularly on “Fire and the Flood,” the horns swell behind Keogh’s voice, at times playing the role of backing vocals—a distinction from the studio recordings. He closed his off-air set with his biggest hit, “Riptide.” Swapping his acoustic guitar for a ukulele, the already-towering Keogh and his folksy song became larger than life and received a rousing round of applause from the crowd. 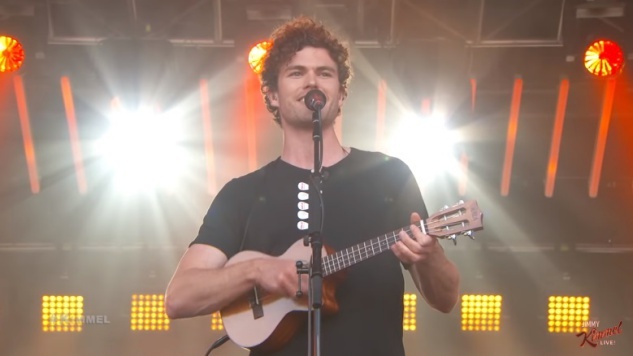 Watch Vance Joy’s performance of “Saturday Sun” and his off-air set below. Find his intimate February set at Paste further down.